I interrupt my regular bulletins to report on our experiences with Hurricane Florence. 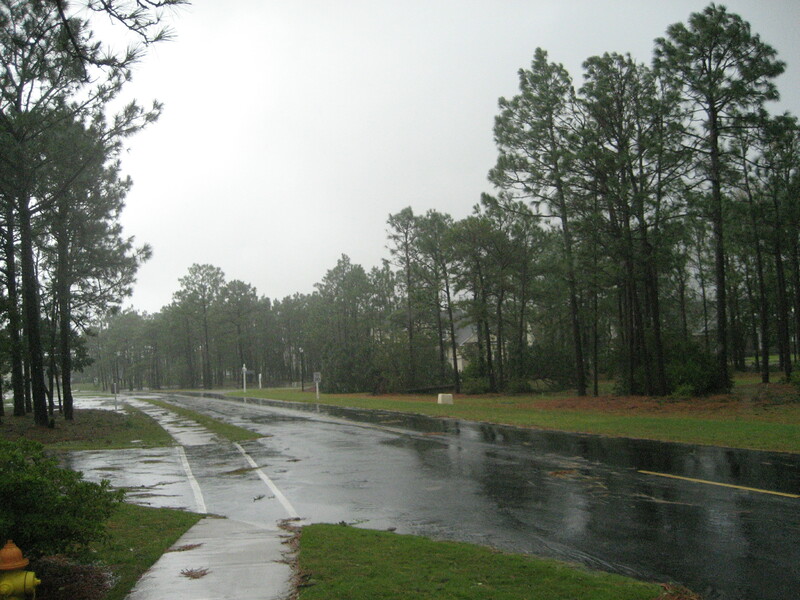 This major storm passed directly over St. James, in Southport, North Carolina, where our family lives, and caused some catastrophic devastation. 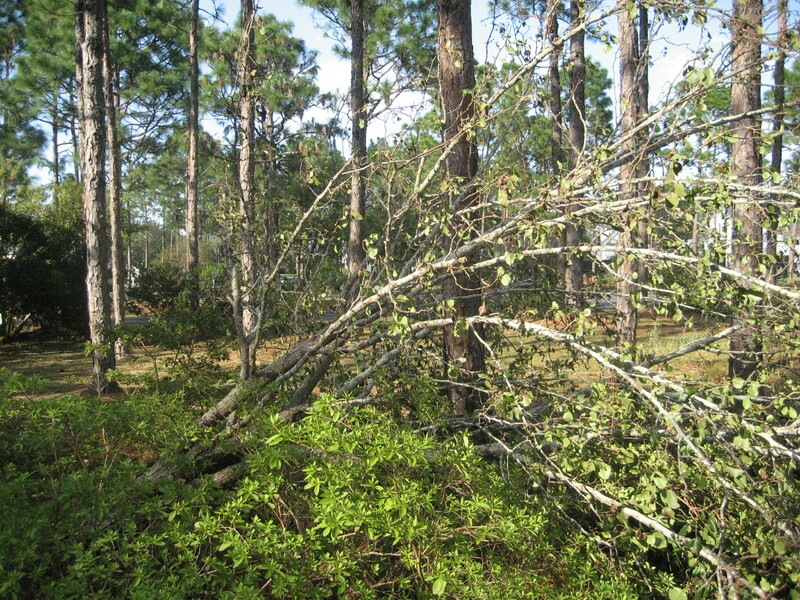 It left us without power for several days, and we were able to keep up with what was going on only through our battery-driven radio, and cellphone contact with friends – some of whom had evacuated the town for safer havens. St. James issued a ‘mandatory’ evacuation order, but that meant that, if you did decide to stay, it was at your own risk, with no access to emergency facilities. About 300 families – maybe 15-20% of the occupants of St. James – decided, like us, to sit it out. 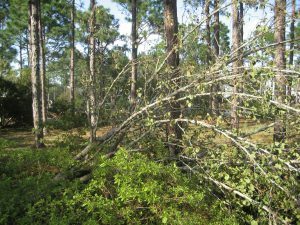 We have survived hurricanes up to a category 3 or even 4 beforehand. 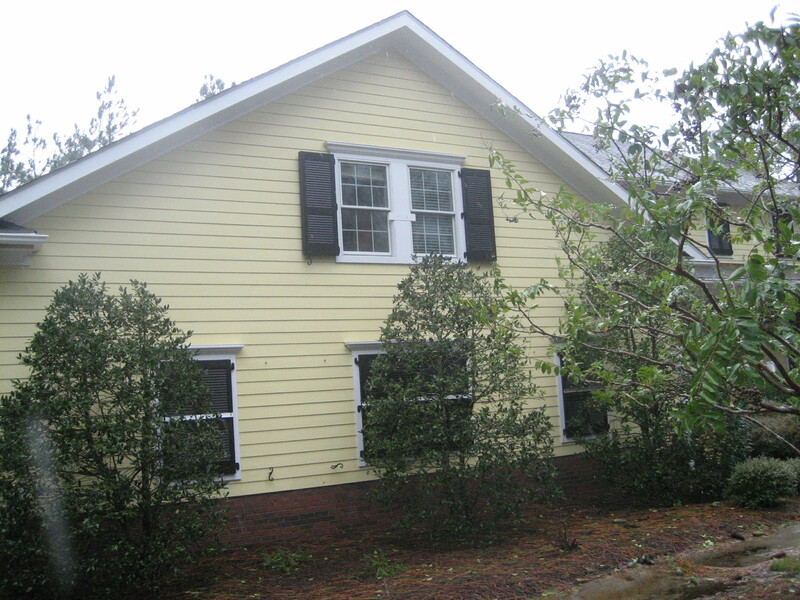 We have a variety of hurricane-shutters installed. 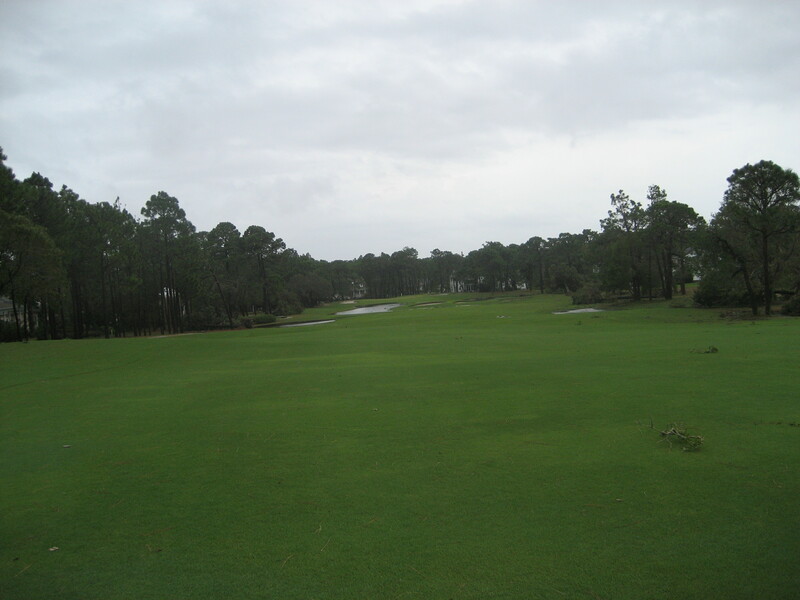 While we are only a couple of miles from the ocean, we reside at the highest point in St James, about thirty feet above sea-level, which means we drain quickly. Brunswick County beaches face south-west, so the winds are normally less severe. We have stands of trees protecting us on the south side, where the first, ninth and seventh holes of the Members Club golf course – as well as the driving-range – help to break up the fiercest gales. And our closest friends are 1500 miles away. All of which reinforced our decision to stay. But we do not have a generator. 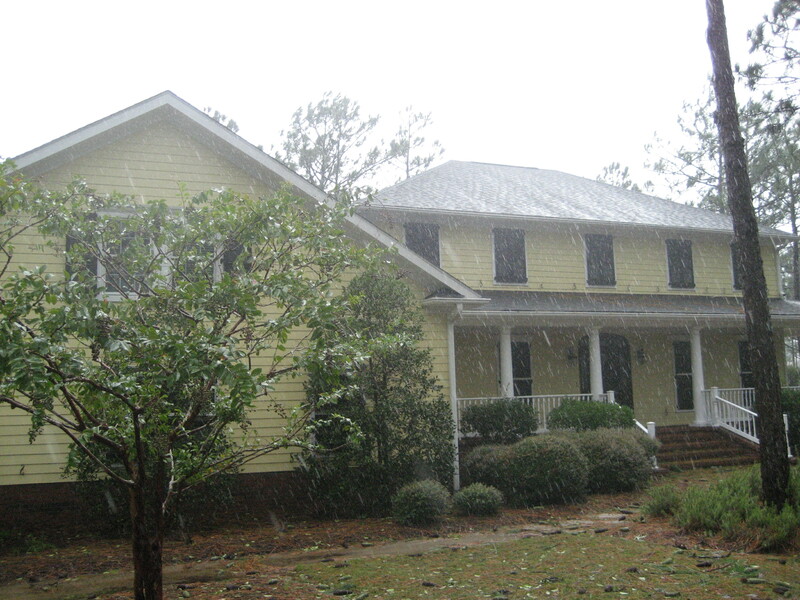 . .
Our shutters are of a variety. Several are managed by a hand-driven crank, with a ratchet mechanism. Many are true shutters, which are closed and secured by bolting on a simple iron rod – downstairs from the outside (see picture) and upstairs from the inside, with one notable exception. We also have concertina-type doors that roll across the two large window-doors at the back of the house. The front door, and the windows of the recently converted back porch are all designed to resist hurricane-force 4 winds. But this was no ordinary hurricane. It was enormous – about half the size of France, which is 210,000 square miles. And even though it was only a category 2 when it made landfall at Wrightsville Beach, it brought an enormous volume of water with it. The water temperatures in the western Atlantic were very warm (in the 80s Fahrenheit), which gave Florence some enormous punch. 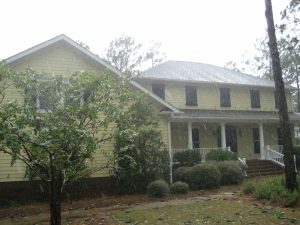 She took a very slow and erratic path, which meant she stayed over the Cape Fear region for days. Forty inches of rain was expected in some parts (I am writing this on Sunday 16th September, without access to any news). Moreover, the ground was saturated. 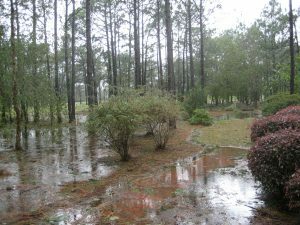 We have had sixty inches of rain this year before Florence arrived – over half of in the summer months – which means that trees were weakened, and there was nowhere for the water to go. Storm surge – abetted by the tides when they were high – was the biggest danger. But this is a very serious matter. People have lost their lives, and property damage must be immense. We are in the hands of highly dedicated engineers and linesmen trying to restore our power. St. James is isolated, with all access roads impassable, and the main interstates (95 & 40) are also closed off in sections. I have not ventured beyond my driveway, but the flooding here must be disastrous in places. 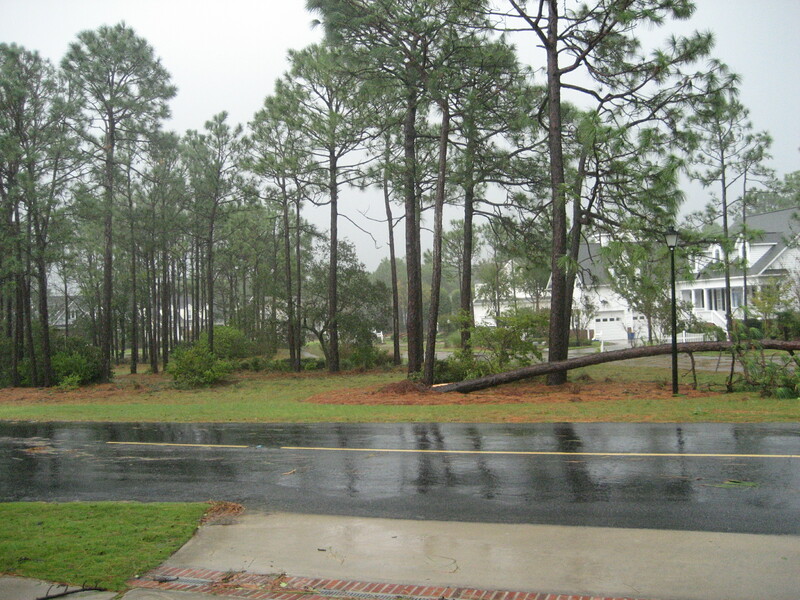 A few trees came down in the triangle opposite our house, but fortunately did not damage any property. One of Sylvia’s Bradford peartrees did not survive. 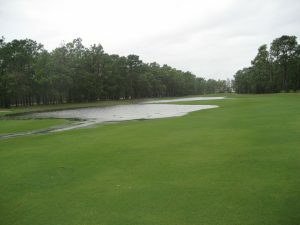 I also took a few photographs of the flooded 1st hole at the Members Club, by the tee of which our house sits. (See below). We shall learn more soon, I hope. The picturesque first hole at the Members Club. Be sure to take enough club to carry the demanding water hazard that bestrides the fairway . 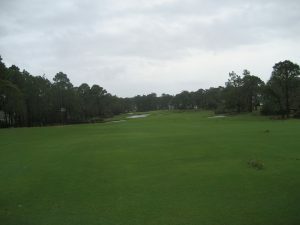 . .
Now you have cleared the water, you will need all of your 3-wood to reach this demanding par five, with its green well-protected by sand and water, and then face a tricky eagle putt. And what about that last shutter? For some reason, the house designer decided that for two windows – in separate rooms – upstairs, each window would not have its own internal bar, but instead they would be linked and secured by an external bar that crossed the intervening wall. That means that a ladder has to be used to free the shutters, fold them back, and then bolt the shared bar tight. And the ladder has to be moved. Well, not only do I not really work on ladders any more, since the last practice I had with this, several years ago, the holly-tree in front of the windows has grown to such an extent that I had to abandon the exercise (see photograph), and risk the possibility that hurtling pine-cones (very dangerous missiles, by the way) would not break through our defenses. One benefit of all of this was that I had a little nook during the day where enough light came through that I was able to read, as there was little else to do but meditate. (I was able to read Professor Foot’s extraordinary ‘SOE in France’, written in 1966 when he could not even admit that SIS existed.) During one long session, I started calculating how much water Florence actually dropped on SE North Carolina. If you take a section of 10000 square miles, which is not massive, just a portion of the tract that Florence covered, and a tenth of Florence’s area – Brunswick County is 1050 square miles, about 150 % of the size of Surrey, England, the area of which is 642 square miles – and project 40 inches of rain, I could fairly easily calculate mentally the number of cubic yards of water that must have fallen in the broader local area. Then I had to convert that number into recognizable gallons. But how many gallons in a cubic yard? I reckoned about 40, but the Encyclopaedia Britannica informed me the divisor was 54. So I was able to adjust my result to come up with 2,000,000,000,000 gallons, that is 2 European billion, and an American 2,000 billion. That means 6 cubic miles of water for the section I describe. Multiply that by six, and Coldspur diehards will recall that this amount would be enough to fill Lake Tahoe. ‘Refer with a certain amount of freedom – yes, with more of it (5)’, until I realized it was much more obvious than I had imagined. I believe the Times of today would have rejected what D. S. MacNutt was able to deploy in the Observer sixty year ago. He disobeyed some of his own rules (such as clue length), and his clues reflect a number of awkward structures (e.g. overuse of ‘I’ and cockneyisms, clumsy joining segments, superfluous ‘thes’ in anagrams, duplicated signifiers in the same puzzle, rather dubious indicators of troublesome letter sequences, and references to living persons), as well as classic and literary references that would be considered far too academic and esoteric for today’s solvers. Still, his influence on the craft of cruciverbalism was enormous, and I believe that individual setter styles ought to be allowed to transcend too rigorous formalism. My thanks to everyone – especially those in England – who passed on their good wishes at a time that I was not able to respond. I shall do so individually. In the meantime, expect a stunning and shocking story on Coldspur on the regular last day of the month. This one will blow you away more than Florence ever could! The power was restored at about 8 a.m. today, Monday. Wilmington still cut off, St. James still isolated, and water not potable, but we are making progress. Yet there is more rain forecast, and I hear thunder in the background, and it is getting closer. Postscript: Now that we are on-line again, I can see how devastating the damage has been, how many lives were lost, and how many are suffering. We were lucky, and I thank all the responders and service people helping out those whose property has been ruined by the storm. In fact, just as I was about to post this on Monday afternoon, we lost cable, Internet and telephone service. It came back at about 1:50 today, Tuesday. TREASURER was happy to help. Glad you and your family are safe. 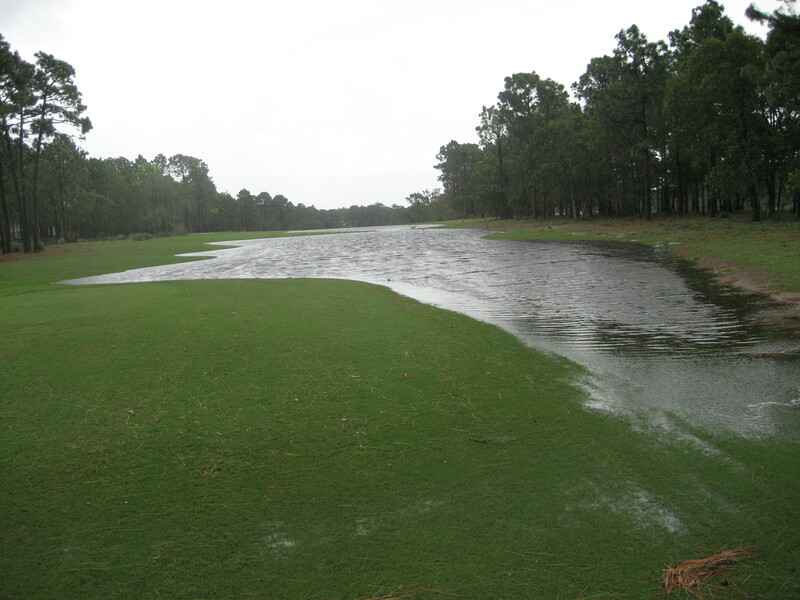 You might want to consider playing from the front most tees on Members #1 until the waters recede. That’s a whopper of a hole now. Sounds horrendous Tony and news here says there is massive damage in Wilmington. Let’s hope the declaration of ‘disaster’ helps the recovery. We are thinking of you all.